1. Enter the 'Editor' of the promotion. Click on the "New field" button to add the fields you are interested in asking the participants for to the entry form. You can also customize the text and image of the page header. In Premium and White Label you can complete the form with all the additional fields, drop-down- lists and checkboxes that you need. Note: The configuration of the additional fields is not included by default in the promotions created with the Basic version. It can be added to the promotion as an extension for $19USD/19 EUR. Note: Firstname and Lastname fields come as default fields and therefore they are not available in the list of fields. If Facebook login is mandatory, these fields will be pre-filled with the user’s complete Facebook name. The administrator can decide which information to ask the user and thus enable the predefined fields accordingly. The fields enabled by the administrator must be filled in by users in order for them to finalize their registration in the promotion. Important: The information entered by users will be private. In other words, only the administrator can see the data provided by users in these fields. 1. Enable the email verification: This allows to add an additional email field so that users have to enter their email address twice. Both email addresses must match in order to pass the validation. This option is available for all versions of the platform (Basic, Premium and White Label). 2. Title of the field: It allows to insert the message to ask users their email address in the entry form. 3. Emails and domains allowed: By default, all email addresses can be used to participate in the promotion, but you have the possibility to limit the registration to an email or a set of emails or, if you prefer, to a specific email domain. Use it to organize a promotion to a closed group of users, for example the employees of a company. In this case, only users who use an email or the email domain you have configured will be able to register in the promotion. You can enter several emails or email domains (one per line). 4. Emails and domains not allowed: By default, no email is banned from participating in the promotion, but you have the possibility to insert an email or set of emails, or a domain or domains that you won't allow to register in the promotion. Users who try to participate with the specified email or email domain won't be allowed to register and will receive an "invalid email" message. You can enter several emails or email domains (one per line). 5. Create a validation email: This allows to create a validation email so that users must verify the email address used to register in the promotion. This email is created using the Emails Platform, which will send an automatic email to the participant with a link to verify the email address. Click here to learn how to create this validation email. 6. Disclaimer: This allows to enter a legal text that will appear in the entry form of your promotion. It is optional and does not exclude the terms and conditions. Writing-based contest: The ‘Comments’ field allows the user to write a text in order to enter the contest. The user can submit a text of up to 65,000 characters. Photo contest: The ‘media’ field allows the user to choose an image file and upload it to the application. 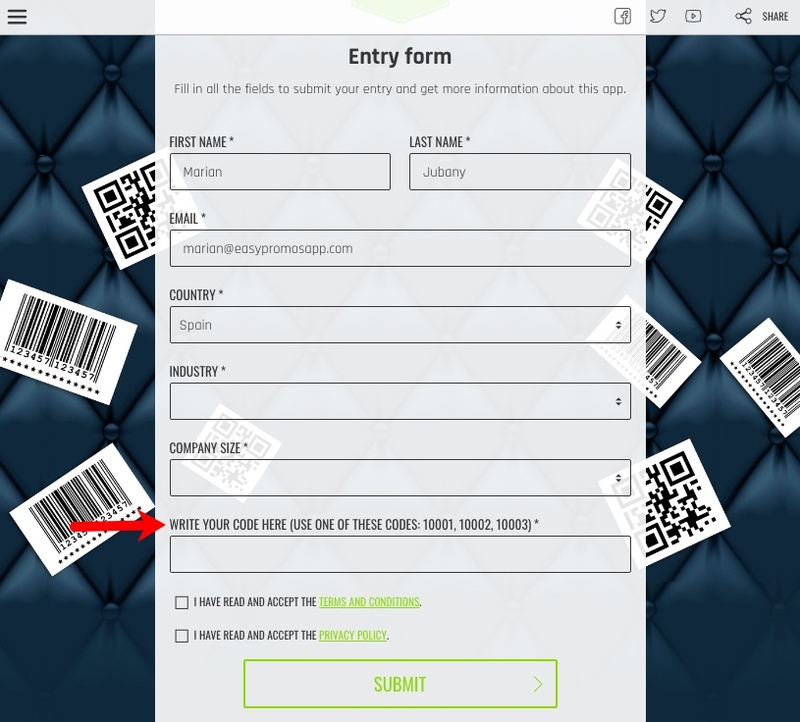 In photo and video contests, it is also possible to add the ‘Comments’ field to allow users to write a description or caption of the photo or video that they upload. Note: Review these contests tutorials to learn more about how to configure these fields. Additional fields are available in the Premium and White Label versions of Easypromos. The administrator can add new fields, which are different from the predefined ones, to the entry form. These can include: address, ID number, province, t-shirt size and so on. 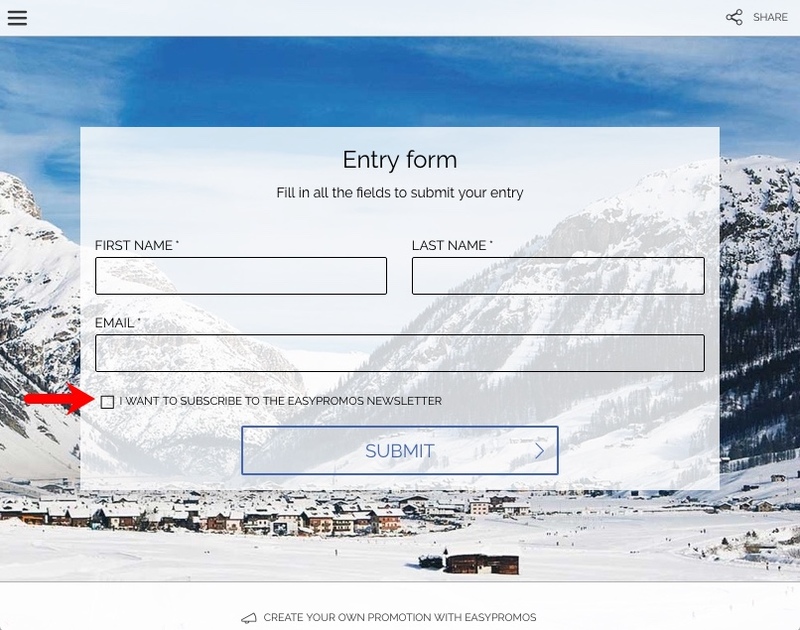 Note: The customization of the entry form with additional text fields is not included by default in promotions created with the Basic version. It can be included as an extension for $19USD/€19EUR. They also allow the administrator to include a questionnaire, requiring users to answer a series of questions in order to register for a promotion. In this way, the administrator can obtain value-added information as well as personal details from the user. Note: for questionnaires, question and answer contests and market studies, we recommend the Questionnaire and Trivia feature. Title: The text field can be customized with a title, which is the text that will appear in the entry form. Short title: Text to identify this field in the entries list. We recommend you to use a maximum of 2 words. Text length field: Depending on what the field is to be used for, the administrator can enable either a short text field or, if more space is needed for the answer, a long text field. The short text field has a limit of 200 characters, while the long one can go up to 65,000 characters. Validation method: This option allows you to validate the content that the user writes in the text field, using, for example, an alphanumeric code based on the criteria defined by the administrator. Is this field mandatory? It is possible to decide whether to make this field obligatory for the user or not to fill in. Make this custom field public? You can decide if you want to make this text field public. In this case, the content of the field will be published in the gallery. Title: The administrator can customize the title of the drop-down list. This will appear in the entry form as a question. Short title: Text to identify this field in entries list. We recommend you to use maximum 2 words. List options: In this field the administrator can write the different options that the drop-down list will display, separated by comma or one option per line. Is this field mandatory? The administrator can make it obligatory to select one of the options in the list. Make this custom field public: If you want participants to be able to see the options selected by other users, the administrator can make the list public. Title: Customize the title of the radio button field. This will appear in the entry form as a question. List options: In this field, the administrator can write the different options that form part of the radiobuttons list, separated by comma or one option per line. Is this field mandatory? The administrator can make it mandatory to select one of the options in the list. Make this custom field public: If you want participants to be able to see the options selected by other users, the administrator can make this field public. Title: Customize the title of the autocomplete list. This will appear in the editing form as a question. List of options: In this field, the administrator can write the different options that form part of the autocomplete list. These fields are additional and can not be public. The Opt-in field allows you to add check boxes that the user must complete before finalizing the entry form. When the administrator defines the terms and conditions, a check box will always appear by default in the entry form that requires users to accept these conditions in order to continue with the registration process. Additionally, the administrator has the opportunity to add up to 5 new check boxes, as shown in the image below. These check boxes are useful, for example, to ask user if he/she would like to receive or subscribe to a newsletter. Label: Write a text explaining what kind of permission the user is giving when accepting this check-box. Set up as mandatory: The administrator can make it mandatory to confirm the user participation. Checked by default: Enable this option if you want to show the opt-in checked by default. When you check or download the list with the participants, you will find this field information oin the column titled "VERIFICATION FIELD N1 ", and if more than 1 verification field is configured, these fields will be displayed in numbered columns. Note: The the terms and conditions check box is mandatory so it doesn't appear in the participants list. Do you need a double confirmation from users as they have marked the check box? 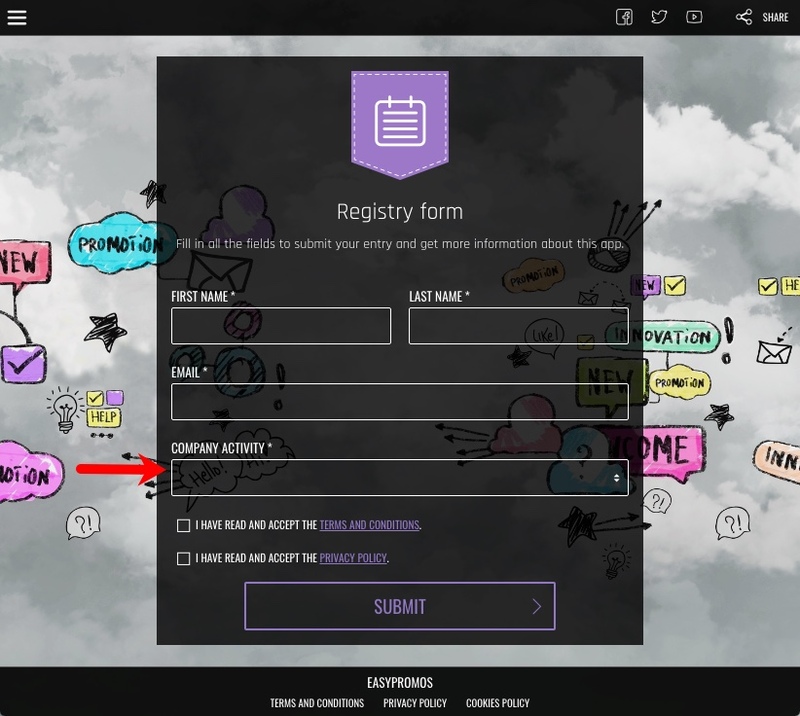 Additionally, you have the possibility to configure and send an automatic email to each participant with a confirmation link that the user will have to click to confirm that they have checked the opt-in checkbox of the form. In this way, with this functionality you will be able to obtain the explicit consent of the users for the processing of their personal data, in accordance with the good practices indicated in the General Data Protection Regulation from the European Union, which requires clearer information on how the personal data is processed. Learn here how to create a double opt-in confirmation email. Note: The functionality of enabling a double confirmation for check boxes is only available for Premium and White Label promotions. This field allows to ask for an extra date in the entry form. It can be used to point out what day the product was bought, their child birthday, what day they attended at the event, etc. This field allows the user to upload a file to the promotion organizer. This can never be a public field. Any text, picture or PDF file can be uploaded. The field allows you to set the maximum file size from 1MB to 10MB. It can also be set up as a mandatory field. 2. Can the fields be rearranged the form? 1. Full name of user. 3. 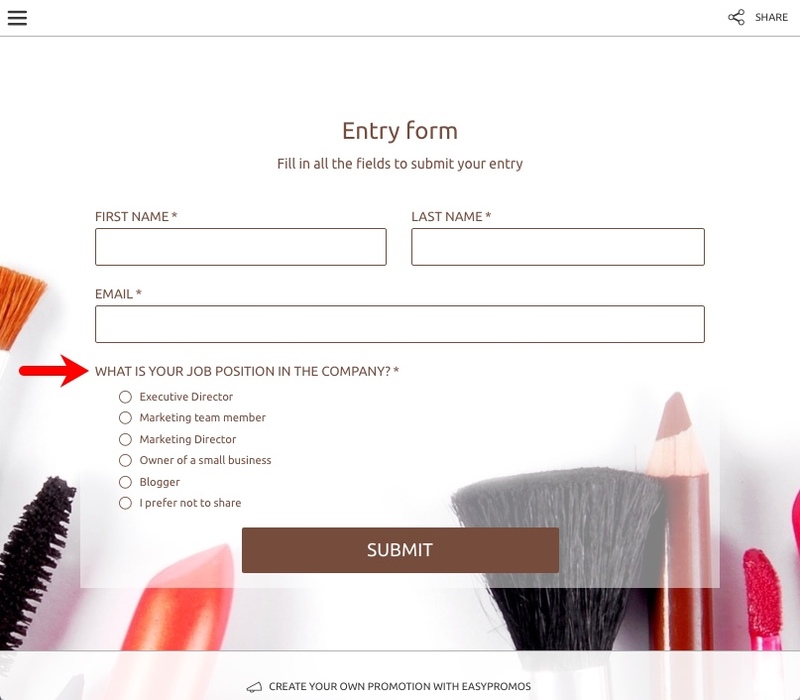 Additional fields: These fields can be arranged from the promotion Editor/ Entry form page. Note: In the checkboxes, first the terms and conditions and then the additional checkboxes are shown. In addition, the administrator has a statistics module that can help complete participants’ data. Learn to analyze the results with the Easypromos statistics module. I want to create an Instagram sweepstakes but my Instagram profile does not appear. What I can do?